Arctic Cat Mud Pro 700-Review. Ready To Go Mud ATV From the Factory! So just what is an Arctic Cat Mud Pro? Basically, it's a factory "built for mud" 4 wheeler. Arctic Cat noticed there were a lot of folks enjoying atv mud riding. Problem was that it took about $5,000 worth of mods to get their rides mud worthy. Not to mention voiding the warranty. Solution? Take an existing model - the Arctic Cat 700 H1 EFI - and factory modify it specifically for atv mud bogging. A lot of the needed parts were already on the 1000 Thundercat. Throw on a few custom parts, paint it screamin' green, and roll 'em out the door with a full factory warranty. All for less than $1,000 more than the 700 SE! Arctic Cat builds the first Ready-to-Go Muddin' ATV! Update! Although this article covers the original MudPro, there have been a few changes for the 2012 model year. The new MudPro 700 comes in two models, the basic 700i and the upscale 700i LTD. The base 700i deletes the winch and bumpers and now comes with Maxxis 28" Zilla tires on aluminum wheels. The good news is a lower price - $10,299. Add back the winch, front and rear bumpers, and electric power steering, and you have the MudPro 700i LTD. At $11,199 it may be the best value. All 2012 models get upgraded axles and improvements to the electric fan to improve some reliability issues that cropped up on earlier versions. Everything else in this article still applies to the current Mud Pro 700i. 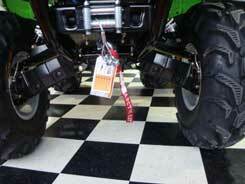 The Arctic Cat Mud Pro 700 comes with heavy duty bumpers, a 2500 lb. winch, 28" mud tires on aluminum wheels, and a special snorkel. Here's a short video of a ride test that includes the 700 and 1000 Mud Pro. Not a real in- depth test, but it will give you a good idea of what the machines will do. Integrated snorkel with engine intake and venting for CVT belt. 700 H1 engine with remapped electronic fuel injection to work with snorkel. Modified duct work and belt cover for better sealing in mud and water. 4.0 gearing (stock is 3.1). Top speed is 50 mph. Modified clutch recalibrated to match gearing. Spike dampener and axles from the 1000 Thundercat. 28" Highlifter Outlaw tires on 12" aluminum wheels. Modified shock valving, springs, and pre-load adjustment. Taller seat and matching handlebars. Easier to use front diff lock switch. Front mounted 2,500 lb. winch. Heavy duty 2" receiver hitch on the rear. Special Arctic Cat Mud Pro Competition Green Metallic automotive type paint. 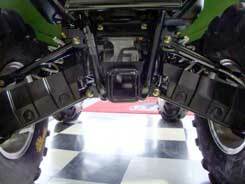 You'll also be getting 14" of ground clearance and 10" of competition suspension travel. The driveline spike dampener and axles are lifted from the Thundercat. Throw in a 2" receiver hitch, full length skid plate and CV guards - now where's the nearest mud bog? 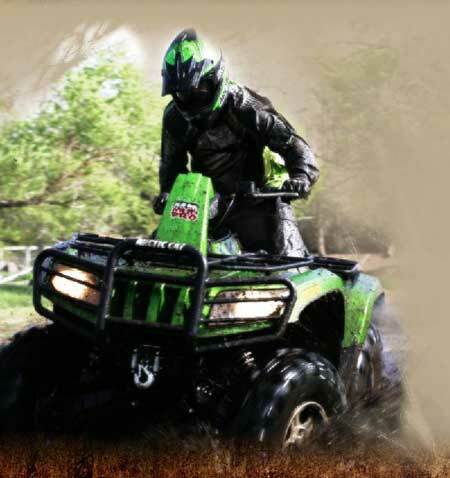 While aimed at ATV mud riding, the Arctic Cat Mud Pro is a better all around four wheeler than you might think. It's good in slow, tight, rough terrain with the high ground clearance and low speed pulling power. That same pulling power, along with the heavy duty bumpers and racks, 2" hitch, and beefed up driveline, make it a good utility ATV when it's time to work. But the Mud Pro is definitely better at its' intended use than any other stock machine out there. If you plan on putting a new ATV in mud, this is the one to have. Modifying any other quad for mud riding would probably cost between $3,000 and $5,000 to get it to the same level as the stock Mud Pro. Plus, you void the factory warranty doing it. 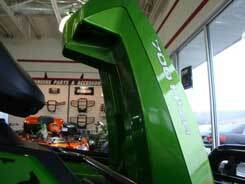 Arctic Cat doesn't have the best reputation for reliability, and their dealer network is pretty thin in some areas of the country. We have noticed that a lot of the reliability issues seem to be dealer prep problems (stuff falling off, no oil in the engine, etc.). So if you live near a good Arctic Cat dealer and want to go ATV mud bogging - we highly recommend you give the Mud Pro a look. But don't just take our word for it. Here are a few quotes from some early owners. "This machine will be matched by no other stock machine with snorkels and tires. It is a complete animal in the mud and deep water." "If you are into the mud or rock scene there is no other choice. 14" of ground clearance, low gears, clutch work, 28"tires and snorkels make this machine the new standard." "The AC guys hit the nail on the head with this ride." 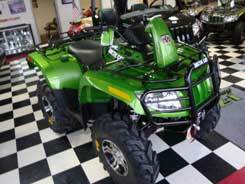 With the base model Arctic Cat Mud Pro 700 selling for just over $10,000, that's a lot of mud ATV for the price! Arctic Cat Mud Pro Model Overview - specs and info on all the new models.